My sister and her family are planning a trip to Hawaii next year and as we offer our recommendations and reminisce about our trip to the Big Island last October, I wanted to share this list. Here are a few of my favorite things we did outside of the resort on the Big Island of Hawaii. Manuakea is the tallest mountain in the world when measured from base to summit at 33,000 ft (though most of that underwater) and 13,802 ft above sea level. It has not erupted in over 4,000 years and is considered to be dormant. The altitude and isolation of the mountain make it ideal for stargazing and observation. It is possible to visit the summit at the top of Maunakea (14,000ft) but it is not advised for those under 16 or anyone with health concerns. However located two-thirds of the way up the mountain at 9,200ft is the visitors center and it is open to the public from 12pm to 10pm every day of the year. On Tuesday, Wednesday, Friday and Saturday evenings from 6pm to 10pm, weather permitting they have their Stargazing Program where they pull out their telescopes for viewing and their staff will give a “tour of the sky.” We had a chance to do this and loved it! The Stargazing Program is free and you can arrive anytime between 6pm and 10pm however the drive can be a little bit scary on the pitch black roads and it is worth mentioning that you should make sure you have plenty of fuel as the nearest stations are 35 miles away. The altitude changes quickly and the temperature will drop fast. It is important to remember to dress warmly if you make your way to Maunakea. During our visit in October, the temperature at our resort was near 90 degrees Fahrenheit and on the mountain the temperature dropped to near freezing at about 40 degrees. The sky on the Big Island is one of the most beautiful skies I have ever had the pleasure of viewing. The openness of the island, scarce lighting and low population make this sky easy to view and truly breathtaking. We decided to shop for a luau outside of our resort (The Hilton Waikaloa) for a number of reasons but the biggest reason was price. For the show on our property, the cost was $128 per person. Children aged 5-12 are priced at a staggering $70/child (children 4 and under are free) and that was simply too rich for our blood. While the price included an open bar, dinner, and fire dancers spending more than $330 for a single dinner was far too much. To attend the show with no food or drink the cost is $65 for adults and $45 for kids. Upon further investigation we found that the nearby Marriot Waikaoloa held a Luau on the opposite days as our resort for something around $100 with a similar food and drink options with the exact same luau performers. This was a slightly cheaper option, but not enough of a savings to skip out on billing the cost to our room and missing out on Hilton points, along with staying on the resort. The open bar held little value for us and we were unsure how our daughter would hold up for the entire event so we decided to shop further afield and ended up with tickets to Voyagers of the Pacific Luau at the Royal Kona Resort about 25 minutes away by car. The cost was $68 per adult (free for our daughter age 3) and similar to the other luaus it included complimentary drinks, a traditional buffet meal complete with a Kalua Pua’a (roast pig) ceremony and a show. It was half price and we already had a rental car, so it made a lot of sense for us to go with this option. The food was good and the show was entertaining. We sat waterfront and had a beautiful sunset just before dinner started. Our daughter, Lucy, enjoyed watching the performers but she was most intrigued by the live music the band was playing and wanted to dance along and put on her own show. We were sitting on the end and right in front of the band so it was the perfect place for her to dance without disturbing others watching the show. Overall we felt that the value for money was great and we were happy with our decision to find a more affordable option. We knew we wanted to take a helicopter tour over the active volcano on the island, even though I am terrified of flying (particularly in small planes and helicopters). Yes, you read that right. This would be one of the most exciting and worthwhile experiences that we have ever indulged on. We found a deal within one of the coupon books widely distributed at the resort and shops around the island. This particular coupon was through Expedia. Following a quick reservation phone call we were sent our confirmations via email. The operator for our excursion was with the legendary Blue Hawaiian Helicopters and departed from the Hilo airport. Whilst it didn’t seem like a commercial flight, the tours are considered the same as flying an airliner in the U.S. Children over the age of 24 months must have their own seat and pay full fare. With any small aircraft weight distribution is important, therefore each passenger is weighed prior to the flight and seats are assigned accordingly. There are some limitations and you can read more about them on their website in the link above. Tip: The most affordable flights we found were by first making our way by car to Hilo (if you are staying elsewhere on the island) and taking our flight from there. Flights can be taken from the Kona side as well, but the tours are longer and you are charged more to make your way in the air over to the Hilo side where the volcano is located. This island is gorgeous and like no other island I have ever visited. When we wanted to get out and explore beyond the resort, we simply hopped in the car, put the top down and drove under the big blue sky. It was easy to just take in your surroundings. There were plenty of places to pull over and enjoy the scenery with little villages to visit all around the island. By taking impromptu car trips we eventually circled the entire island. 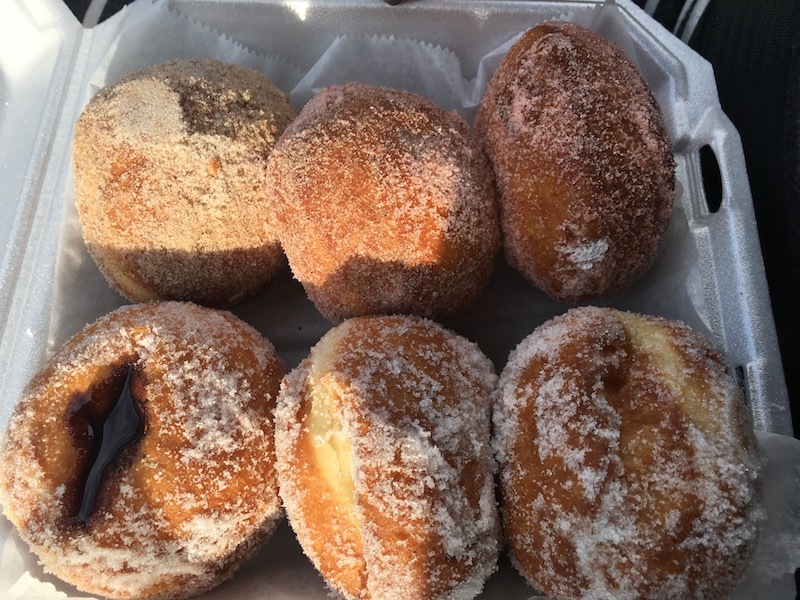 Malasadas from a road side stand. and pulled over to enjoy this sunset. These were just a few of my favorite things we did while visiting the Big Island of Hawaii. Have you been to the Big Island? What would you add to this list? You’d need a child old enough to handle a pretty long hike over rough terrain, but I recommend driving down to Kalapana (the town abandoned after Kilauea erupted in the 80s). You can hike across an old lava flow and watch the current lava flow right into the sea. Beware, however, that actually being able to walk to the lava flow by yourself can change daily due to flow conditions. When my wife and I went, they had shut down the trail because an active lava flow was going right over it, so your only option was to pay a tour group to go down there, at about $100 a pop I think. Other suggestions: the Holei Sea Arch at the end of the road in Hawai’i Volcanoes National Park, and the Kilauea Crater Visitor Center. It’s really cool especially at night, as you can see a red glow emanating from the crater. For an “easy button” option, there’s also coffee plantation tours outside of Kailua Kona. We went to Mountain Thunder Coffee Plantation. If your kids like cats, they have a couple roaming around that they can play with while touring the plantation. its mauna kea. two words not one. Just like how if I were to arbitrarily combinewords it would not be correct.